CEO Tim Cook and the Apple team announced their Next Big Things on Tuesday. After much anticipation, Apple rolled out a new, smaller iPad on Tuesday at the California Theater in San Jose, but not before unveiling new products from some of their other lines. 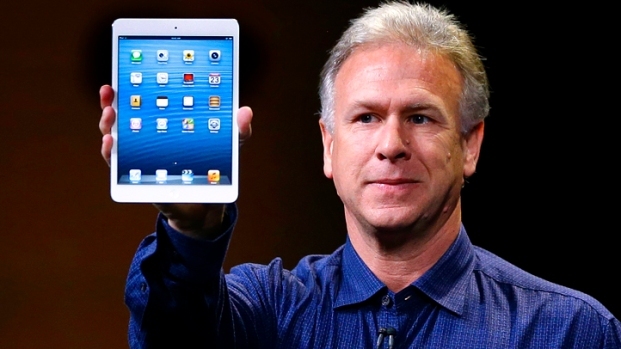 The announcement of the incredibly "thin and light" 7.9-inch iPad mini was hotly anticipated. The "mini" is 7.2 mm thin, "as thin as a pencil," and only .68 pounds - 53-percent lighter than a full-size iPad. The mini will cost $329 and pre-orders start Friday. The LTE versions will start at $460. That all came from Apple's senior vice president of worldwide marketing Phil Schiller, who teased the audience about half an hour into the presentation by asking: "You knew there'd be something called 'mini' in this presentation didn't you?" The mini announcement didn't come until about an hour into the event. Before the mini was rolled out, there was plenty of Mac-love for other products. Apple introduced a "crazy thin" 5-mm iMac, 80-percent thinner than the previous model, with thin glass and no air gap between the glass and display. The price? $1,299. The audience, many of whom are Apple employees, whooped and cheered. A new iPad 4 was introduced, as well. It has a 10-hour battery life and 16 GB, offering what Schiller said is, "twice the performance" for the same price as the previous one, $499. Cook extolled the virtues of the iPad, saying the company has sold 100 million iPads for a simple reason: "People love their iPads." Cook then noted how popular the iPad has been in schools, citing Dr. James Ponse, a school superintendent in Texas, who called the device a "game changer" in education. Cook said that 2,500 U.S. classrooms are using iBooks textbooks. The event kicked off with Cook reminiscing a little about the past and listing a whole bunch of sales numbers. He talked about the iPod Touch - which sold over 3 million new iPods, and the iPhone 5, calling it the "fastest selling phone in history." He also recapped features like iMessage, saying there have been more than 300 billion iMessages sent to date, and that Apple now has more than 1.5 billion books in the iBooks store - customers have downloaded 400 million of them. Schiller also introduced a 13-inch MacBook pro with Retina display, stereo speakers, FaceTime HD camera, dual mics and a backlit keyboard- and the audience clapped. It is .75 inches thin and weighs 3.5 pounds - almost a pound lighter than previous generations. He also said that this new notebook as 4 million pixels - four times the pixels of the previous generation. And it cost $1,699 - $500 less than the 15-inch MacBook Pro.